Other Products by Body Science. 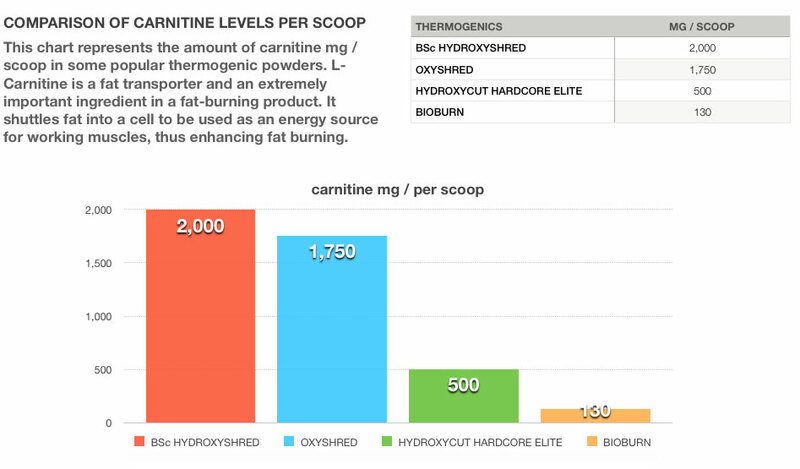 Search other Thermogenics products. Body Science BSc HydroxyShred Neuro-Thermogenic contains a range of amino acids and phytonutrients, designed to maximise thermogenesis, enhancing the effectiveness of weight loss or shredding programs. It contains Garcinia cambogia (aka Garcinia gummi-gutta), a plant containing hydroxycitric acid, equivalent to a whopping 2,500mg per 5 gram serve. This plant has been demonstrated in clinical trials to inhibit adesosine triphosphate citrate lyase and therefore contribute to reductions in body fat and visceral fat deposition1. Garcinia cambogia has also been shown to reduce food cravings. 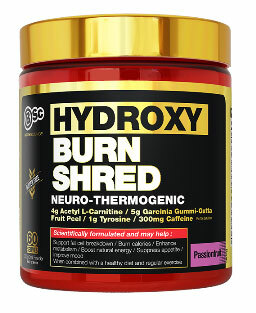 In addition, each serve of BSc Hydroxyburn Shred Neuro-Thermogenic contains 2,000mg of Acetyl-L-Carnitine (ALCAR), which is a specialised acetylatyed form of carnitine that passes through the blood brain barrier. Once in the brain ALCAR dontates acetyl groups, supporting the synthesis of acetylcholine, a neurotransmitter intimately involved with learning and memory2. Additionally, Carnitine, which is naturally synthesized in our body, has the sole purpose of delivering free fatty acids into the cell for beta-oxidation. And what does beta-oxidation mean? Burning fat for fuel ... like a log hefted onto a fire. For us, fuel is called ATP. BSc HydroxyShred brings together a blend of ingredients that have been extensively researched and trialed by elite athletes. Body Science HydroxyShred Neuro Thermogenic is an extremely potent thermogenic powder that will have you shredding unwanted fat whilst elevating mood and delivering pin-point focus and enhanced mental alertness for a superior workout or to breeze through your daily routine. 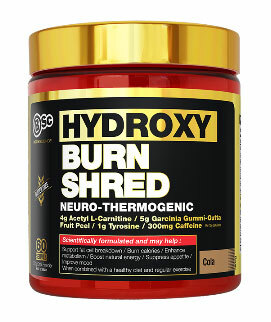 What does Hydroxyburn Shred do? Each ingredient in BSC Hydroxyburn Shred is provided at a clinically effective dose for each active ingredient, not just a small token amount, enough to be read on the label as an ingredient or as part of a proprietary blend. This dose-effective thermogenic mobilises, transports and destroys stubborn fat cells and speeds your metabolism to increase your daily fat burning potential. Containing Green Tea extract, a source of the all-powerful EGCG, which is a polyphenol well known for its ability to elevate 24 hour basal metabolic rate. This is the rate at which you burn calories. Additionally, Green Tea is an excellent source of antioxidants, and is believed to also have anti-viral activity3. 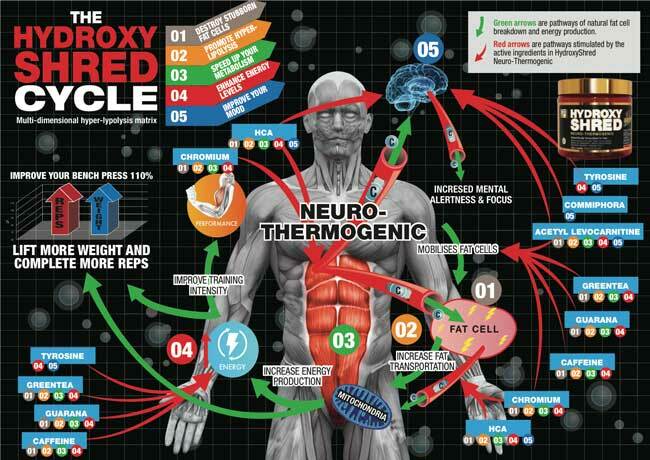 Body Science HydroxyShred Neuro-Thermogenic is packed with metabolically active compounds, at therapeutic levels, designed to take your fat-stripping efforts to the next level. Is Hydroxyburn Shred a Pre-Workout? It is not classed as a pre-workout. However, it can be used as a pre-workout. The caffeine contained in it will boost energy levels and motivation to train, while the carnitine assists with endurance, and protects muscle tissue from damage, also helping to reduce delayed onset muscle soreness. If you are looking for superior weight loss results we recommend taking 2 x 5g serves of BSc Hyroxy Shred daily. One serve in the morning and one serve around lunch time. Alternatively, if you want to use BSC HYDROXYBURN SHRED as a pre-workout we recommend taking one 10g serve 20-30 minutes pre-workout. Use only as directed maximum 10g consumption per day. To assess caffeine tolerance, begin with half a scoop, and take before lunch time. Looking for a shredding stack, try it with BSc Hydroxyburn Lean 5, the protein powder with a fat-burning kick!